In an interview given in 1990, Sandra Schneiders observed of the Trinity that, for Christians, "God is more than two men and a bird." While this should hardly come as a surprise, the observation nevertheless flies in the face of many artistic renderings of the Trinity. 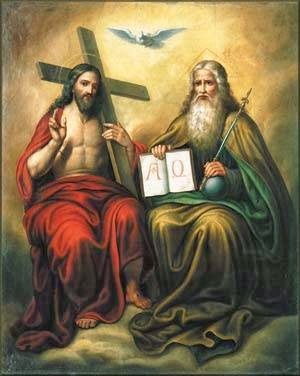 Indeed, I think it is the case that art attempting to depict the Trinity is at least partially to blame for the general irrelevance of the Trinity in the lives of most Christians. Think about it: when was the last time you prayed to the Holy Spirit? One way of thinking about the Trinity in a way that may be helpful is to think of the Trinity as the event of Karaoke of God's Kingdom. Without the Author, you'd have neither the Lyrics nor the Music. These both flow from the Author. The Lyrics tell us what the song is about. The Music gives us the rhythm that animates the Lyrics. Notice, however, that the Lyrics and Music are distinct yet necessary. Lyrics might be nice but, without music, there's no sense of the song's flow. The Music may be beautiful or catchy but, without the Lyrics, there's no way to tell what the Author is trying to communicate. But, and here's the genius of Karaoke, the song must be performed. I've been to enough Karaoke bars in my lifetime to know that when someone gets up to sing a song by Aerosmith, or Michael Jackson, or U2, that the person is going to attempt to channel the way the song has been performed by someone else. This is done, to be sure, with radically varying degrees of success. Nevertheless, Karaoke is fun because it rests upon a person performing a song often made famous by one or more classical performances. When we watch someone attempt Karaoke, we are watching a person perform the song by using his or her own voice to give expression to the Lyrics. The rhythm of the Music animates and guides the song, provides pitch and tempo, as the performer sings. In the one event of Karaoke, the performer attempts to express here-and-now the Author's Song using one's own voice and abilities. For those in the audience, it's impossible not to compare the performance to the "classical" renditions of the song, yet when the artist offers something novel or innovative, it's precisely this "play" on the classical performance that makes this particular event memorable. Christian discipleship is, in my imagination at least, very much like Karaoke. God has been made known in Word and Spirit, in Lyric and Music. Christians believe Jesus is the way the Song of the Creator should be performed, that Jesus is the "classic" showing us how to do this. The Holy Spirit, the rhythm of the Trinity, has been offered to all believers as the Music animating our lives and inviting us to make our own the Words of the song. We are, each of us, invited to take up the microphone...or the Cross!...and sing God's Song. When Catholics talk about Saints, we're basically talking about holy women and men who have shown us throughout history different ways of performing the "classic." Saint Augustine, Saint Thomas Aquinas, Saint Teresa of Avila, Saint Ignatius, and Mother Theresa: each one, in a different era, performed the "Song" in a way recognized as fitting very well to the classic. If we think of the Trinity in terms of Karaoke, we may begin to see that each one of us is being invited onto the stage to perform. We've been handed the mic and the Music summons us to perform. At first, we may do this with hesitation: murmuring, stumbling, and fumbling throughout. Fortunately, it's not a one-shot deal: the Music keeps playing and we are invited, over and over, to try again. We are invited to keep an eye on the "classic" and model ourselves after it, making His words our words. and risk performing the Good News. and to be enlivened by your Music. as I hope to perform with you in Heaven's Eternity.